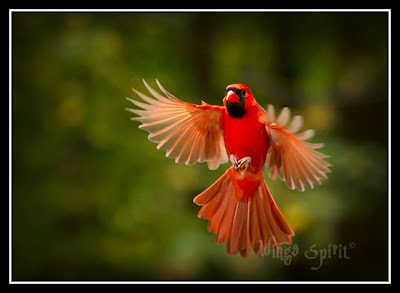 If you live east of Texas, Northern Cardinal (Cardinalist cardinolis) will not be a stranger to you. Even a three years old kid, when spots this bird, will tell you, "Hey, look, it's a cardinal!". They are permanent residents at where they reside and they are the most frequent visitors to the backyard feeders. Since they are abundant, as you can image that birders or photographers will not rush to watch them or photograph them. Some birders at field trips will say" Oh, well, cardinal again ....nothing special." Really? Do you really think Northern Cardinals are not special? I think they are very special even though I have taken hundreds of pictures of these birds, I still think they are one of the most beautiful birds in the east coast.